For a very long time, a couple of long pieces of 2X6 was my motorcycle ramp. Then I attached some ramp lips to them. With this setup, getting onto a normal trailer was fine, but getting into the back of a pickup was treacherous business. A two or three person job depending on the motorcycle. 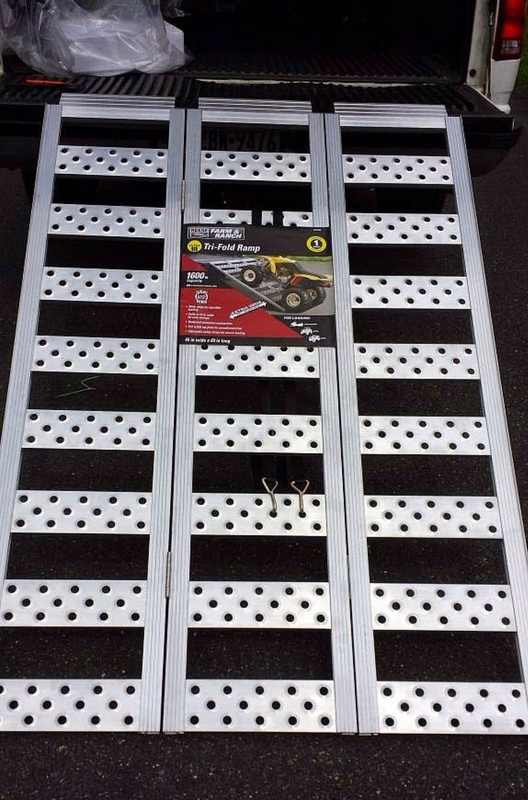 Cheap aluminum dirt bike ramps were periodically on sale, but they typically have large spacing and low ratings as far as weight is concerned. A store credit and a sale at the local farm equipment supply finally resulted in an upgrade to a real ramp. Aluminum, and 45" wide, means I can actually walk a motorcycle up the ramp solo. It has ratchet straps for safety, so unlike my boards, it should stay in place. It is rated at 1600 lbs, so it should be more than enough for the machines I typically handle. I tried it out with the RD350 and it worked as advertised.